This cookbooks has been brought to life by two of the personal cooks of Sri Sri Radha-Gokulananda. For years, there was a folder containing hundreds of recipes in one of the drawers in the Deity kitchen of the Bhaktivedanta Manor. The folder had shown the wear and tear from years of usage-spillage, burn marks and ingredients stains marked every other page. Finally the authors decided to fulfill their long awaited dream - publish a book with the standard used recipes for the pleasure of Sri Sri Radha-Gokulananda. Initially intended to be an in-house user manual for novice deity cooks, happily in this nicely printed edition the authors are sharing their seasoned expertise with the wider world of Krishna-devotees. 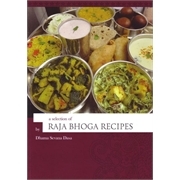 There are certainly already many wonderful cookbooks for the devotees. However, it is clear that the authors, having imbibed the knowledge of such cookbooks, have done rightly to communicate their well-refined sense of how preparing devotional food offerings for the Deities can be done expertly and efficiently, in ways that are surely pleasing to the Lord, while at the same time maintening high standard of quality and cleanliness. 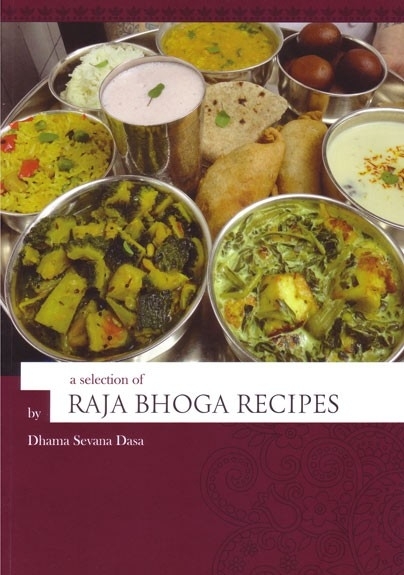 Included in this cookbook are also the secret milk sweet recipes of Mother Kulangana, famous throughout the world and prepared from the ahimsa milk from the Bhaktivedanta Manor's cows. Krishna Kishor Das worked as a medicinal chemist in an organic laboratory synthesising new medicines in one of the largest pharmaceutical companies in the world. Due to reorganisations in the company, he took the opportunity for early retiremet. His regular serving of maha-prasadam after 7pm has expanded to prasadam transfers in the pujari room. There he met Dhama Sevana Prabhu, who engaged him in the Deity kitchen. Thats where the idea of publishing this book sprouted. Dhama Sevana has been a personal cook for the Deities since 1996, when he was asked to cook one offering for the Deities. Not being experienced, he nevertheles took the challenge and over the years became a skilled and weathered cook with the utmost devotion.Cooking is a meditation and allows creativity.It is an art though presentation and colors which are pleasing to the eyes of Lord Krishna.